Nesting Dolls Russian Matryoshka Traditional Babushka Stacking Wooden New set 10. 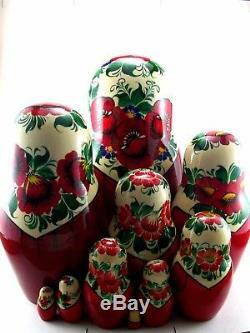 Nesting Dolls set 10 pcs Russian Matryoshka Inlay. Description Nesting dolls Russian Matryoshka. 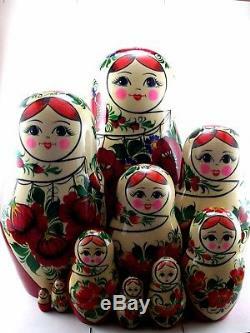 Name: Nesting Doll set 10 pcs Sudarushka. Heigt: 24,5 cm (9.65 inch). Condition: New Russian Nesting Dolls. About why the nesting dolls are unique. This is a real Babushka doll from Russia (not China). Nesting Doll Babushka made in Kirov region of Russia. This is the most northern place of manufacture of traditional Russian nesting dolls. The best wooden nesting dolls for kids. 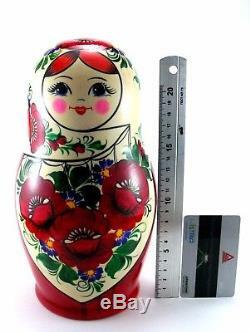 Use this new matryoshka for a: Birthday gift and Christmas gift. This is a good idea for home decor. Pay for Russian Nesting dolls. "Russian Post", Avia small packet. The item "Nesting Dolls Russian Matryoshka Traditional Babushka Stacking Wooden New set 10" is in sale since Wednesday, June 07, 2017. This item is in the category "Dolls & Bears\Dolls\By Type\Nesting". The seller is "nestingdollsstore" and is located in Moscow. This item can be shipped worldwide.